A 5-circuit exercise workout combines maths and PE. 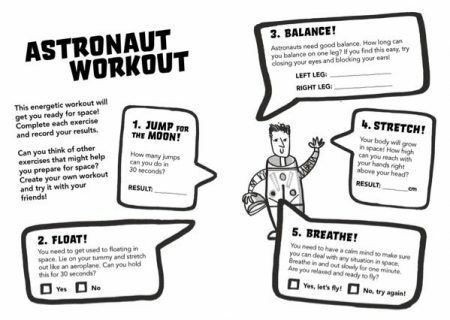 Students will learn about personal health by learning what astronauts need to do to get fit for space. Students will do cardio, core, balance and mindfulness exercises and will need to work in teams or pairs to time, count and also measure each other's height. 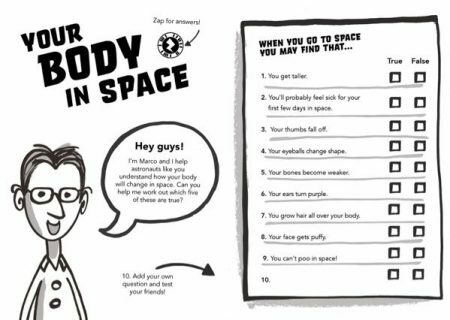 A 10-question quiz about what happens to the human body in space. The final question is one the students must make up themselves to test their peers. 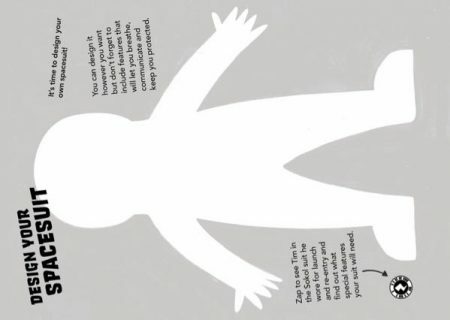 Students will learn about their own bodies and the impact that a low-gravity environment will have on the human body. This activity also includes an augmented-reality app which can be downloaded free, and students can use to check their answers. 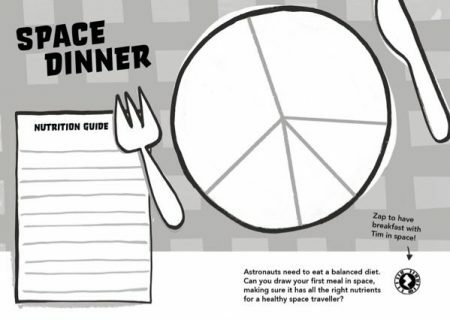 Students will plan and draw a space dinner using the Eatwell food plate as a guide for choosing healthy options. Learn about health and nutrition and also about how astronauts make and consume food when in space. Students can also use the Zappar app to watch a video of Tim Peake making scrambled eggs on board the International Space Station. This activity supports Space Dinner (Activity 0.3 of the Pre-launch Chapter). Learn the seven food groups, what they do and why they are important. 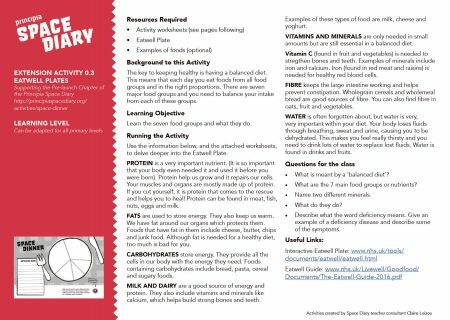 This activity contains three sub-activities which will help students learn about health while practising their literacy skills. Every astronaut needs a spacesuit to keep them safe. With digital and multimedia resources provided, students will research the types of spacesuits astronauts need, and the features they include, then they will design their own suit. Understanding how the Soyuz capsule gets from launch to the ISS is a complex concept. This exercise allows children to create a visual diagram of the path Tim's Soyuz took, simplifying the concept for primary-aged children. This extension activity supports Breaking News: Activity 2.2 in Chapter Two. Imagine you were an astronaut. What would you want to tell the world about your experiences in space? And what if you were a journalist? What questions would you ask an astronaut in an interview? 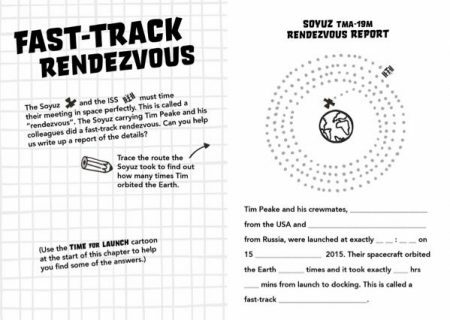 In this activity, students take on the roles of astronauts and journalist, developing questions and answers using the 'Zones of Relevance'. They can then write or record their own interviews. 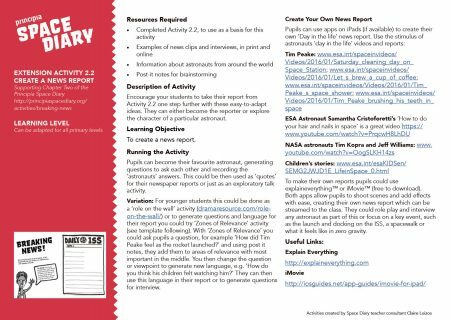 You could even use this activity to develop a class newspaper or journal. Space Gardener – Get Outside and Grow! 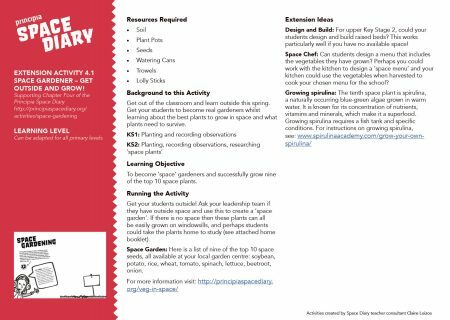 This extension activity supports Space Gardening: Activity 4.1 in Chapter Four. Planting seeds and monitoring their growth is not only fun but helps students practise scientific recording. If you have access to a school or community garden, or can set up some planter boxes, challenge your students to grow some of the plants most suitable for gardening in space. 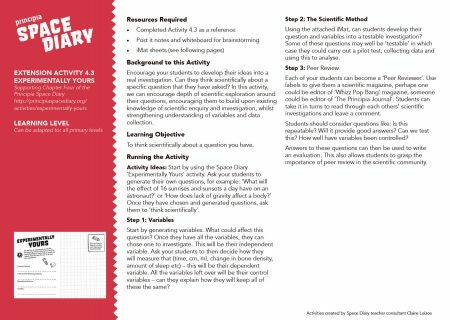 This extension activity supports Experimentally Yours - Activity 4.3 in Chapter Four. Time to put your experiment under the microscope! Once you've designed your experiment in Activity 4.3, examine it more closely using the provided iMat. Learn about variables, the scientific method and peer review, and practise plotting your results.